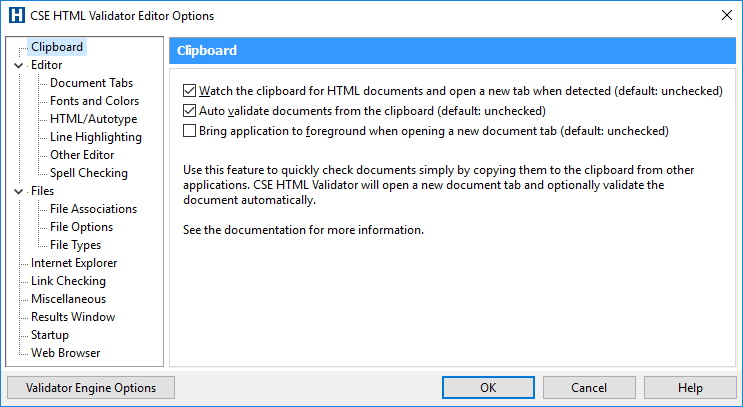 New in version 16 of CSE HTML Validator is the ability for the editor to watch (monitor) the clipboard for HTML documents. This allows for instant validation as soon as you copy an HTML document to the clipboard, because CSE HTML Validator can recognize the HTML document, load it into the editor, and validate it. To enable this feature and to see the available options, go to Options->Editor Options and the Clipboard page. When viewing source in a browser, just select all the text (Ctrl+A) and copy it to the clipboard (Ctrl+C) to instantly validate it.